Edible Parts - Flesh is found mainly in the tail. The legs of large rocklobsters also contain flesh. Carapace can be used for flavouring soups or sauces and in poaching liquids. It is recommended that all crustaceans are immersed in a salt water/ice slurry for a minimum of 20 minutes before boiling, broiling, pithing or cutting. This ensures the animal is immobilised before procedures that may cause pain are carried out. The salt water/ice slurry is made by first filling a suitable container (such as an esky) with normal crushed ice, then adding salt water (sea water salinity). The ratio of normal ice to salt water should be 3:1, which will give the consistency of wet concrete and a temperature of –1°C. It is important that enough ice is provided to maintain the temperature of the slurry. Rocklobsters are highly sought after and therefore often highly priced. Price is usually a reflection of available supply, not quality. 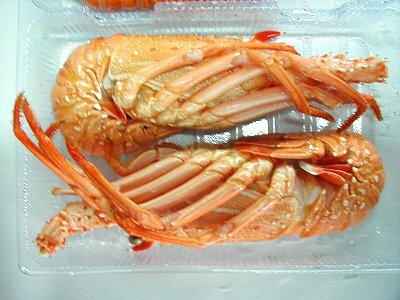 However, export grade rocklobster is always of high quality and high price. Rocklobster flesh is firm, with a sweet medium and rich taste; it retains its shape in most styles of cooking. Poached, baked or barbecued, grilled, steamed, or sliced for sashimi, rock-lobsters make an excellent seafood dish. However, guard against over-cooking or the meat will become tough and leathery. Rocklobsters have excellent presentation potential, so take care not to damage the legs and head. Traditional sauces to accompany rocklobster are thermidor and New-burg, but suggestions for other complementary tastes abound. Try sweet corn, citrus fruits, chillies, tarragon butter sauces, garlic and white wine, or coconut mild curries, or combine in quenelles and mousselines. Prepare as a bisque or serve in a salad with other seafood, or on its own with fresh green peppercorns and char-grilled pineapple. If cooking rocklobster in liquid, try a court bouillon instead of water. Grilled Lobster - Our favorite way to prepare lobster, simply grilled and basted with butter. White Lobster - Canned or fresh boiled lobster in a mustard white sauce, served in scallop shells. Lobster with Oysters - Chopped lobster and oysters in a white sauce served in the lobster shell. Sydney Fish Market takes you through the different kinds of Rocklobsters available in retail, what to look for when purchasing and how to prepare them for cooking and eating.